Earlier this year Buzz Off donated 1000 LLIN nets to a small group of workers who are in rural parts of Northern Cambodia, and who are also going over the border into Lao. Both Pf and Pv malaria are very bad in these regions for most of the year and the teams have to travel in arduous conditions in order to delver the nets into some of these villages. As each team travels into the region they take a load of nets with them to distribute in villages that are badly effected by Malaria. 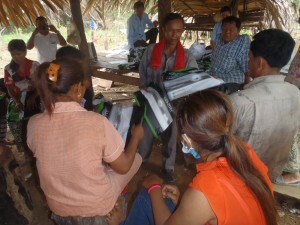 “We went out to the jungle in Ratanakiri and delivered some nets for a very remote Lao village. The people were very happy and thanked you guys for donating it. We also gave some nets out near Stung Treng, the people were very happy to receive the nets. Net donations from people like you make it possible for us to help people like Morgegai who is working in very remote and difficult areas. Your donation of one net can help to save a life in a remote village.